The ongoing and controversial dam project on the Central River in southern Belize has received no press coverage here in the U.S., which is surprising given the sheer number of environmental organizations dedicated to activism and preservation based here. In fact, the only reason we have come across the controversy is because I work in area, and try to keep up on events there through friends and contacts. The surprising thing is that this is not a simple case of a new dam being constructed, but there have been some questionable events surrounding the dam project, some of which likely circumvented the laws of Belize. Not surprising is the fact that numerous government officials are involved in the shady deals with an international corporate developer that has a subsidiary in Belize. Well, good news abounds, as the project is now under review, as a Chief Justice granted Ya'axche Trust a review of the permits granted to the hydro-development company. As reported by Amandala News (Belize), the research permit that has been granted, was done so under questionable circumstances. Further, the 'research' that has been conducted has included the construction of roads, structures, and even helicopter landings in protected reserves. In response to the charges brought by Ya'axche Trust, the Belize Forest Department has issued a cease and desist order to the hydro-development company. The company has been fined a nominal amount, and Ya'axche Trust is claiming damages of $125,000 just to remediate the environmental damage. The case will go before the court on May 6, 2010, and we'll be sure to keep you updated. 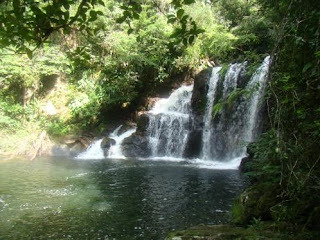 Thanks to Ya'axche Trust for the photo of the Central River in Belize. Well this is certainly good news, and a step in the right direction. Thanks for the update! !